Anandraj Ambedkar, grandson of B R Ambedkar, today accused BJP of trying to use Bihar's former Chief Minister Jitan Ram Manjhi to garner Dalit votes in the assembly elections. He also said his outfit will consider entering the poll arena if it gets resourceful candidates locally. Bihar is likely to go to polls in September/October. Anandraj Ambedkar, who heads the Republican Sena, maintained that Bihar polls would be fought more on caste lines than developmental issues, as the BJP had failed to usher in "achche din" and people lost faith in its 2014 Lok Sabha election promise. "Demands of Dalits are never fulfilled and rulers of the country have always seen to it how Dalit movements, especially that of Babasaheb's, can be finished. "In power politics, they try to attract votes by picking a leader amongst Dalits, settle him politically and then ignore concerns of Dalit. Congress was engaged in this type of politics until now and BJP is following the same path as can be seen from Mr Manjhi episode," Mr Anandraj said. He added that Manjhi's Hindustani Awam Morcha (HAM) and BJP came together as "Manjhi requires BJP and BJP requires Manjhi" to get Dalit votes which are crucial for attaining power in Bihar. "Winning elections there depends on how votes are polarised. Since people have lost faith in achche din promise, election in Bihar will be now contested on caste equations. Therefore, politicos in Bihar and BJP leaders in Delhi too are making attempts at securing Dalit votes. "How the votes' polarisation takes shape can't be predicted now as there are still two-three months' time left for the election," he said. Mr Anandraj said he is unaware of sentiments among locals about the recent political developments in Bihar, but added his outfit will "definitely" contest the election if it gets resourceful candidates. "Ours is a small organisation, like an infant (in politics). But we will definitely consider the option, if we get good and resourceful people," he added. 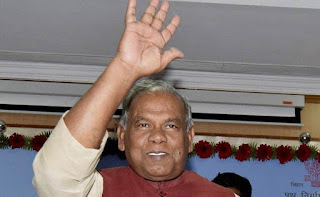 After his meeting with BJP president Amit Shah in Delhi earlier this week, Mr Manjhi had announced HAM will contest the poll in alliance with the saffron party.